Mission work is not for the faint of heart. We admire those brave souls who leave behind the comforts of home and go to foreign fields to bring the love of Christ to people in need. And sometimes it feels uninspiring to be stuck at home in the day-to-day of parenting when others are out there changing the world, soul by soul.Shontell Brewer has a message to renew the spirits of everyday moms: they too have a critical calling as the very first missionaries their children meet. In her informal, funny voice, Brewer points out the many unexpected parallels: A missionary may need to learn a foreign language and new customs to understand and communicate with those around her. A missionary has to follow the path God puts before her, sacrificing sleep, comfort, time, and toilets. Sound like any moms you know?Brewer tackles common challenges from mom-guilt to the temptation to be a martyr to those days when it feels like only a box of cookies and a Netflix binge can restore a sense of peace. But through it all, she shares the truth that there's more to parenting than potty training and orthodontist appointments. Mothers make the love of Christ tangible and understandable to their children. 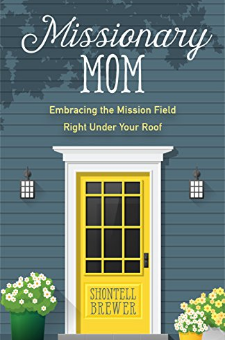 With determination and a few purposeful steps, moms can embrace their own mission field, leading their families--heart, soul, mind, and strength--to Christ.